Most platformers have lots of platforms, many have more than Alice's MR, but usually there is more to do on those platforms! I wasn't degrading it because it's 16-bit like on a 64-bit system, I was just joking (hence emoticon) because aside from Rayman, all Jag Platformers pretty much got labeled as too 16-bit. Especially the ones that are 16-bit ports. I Always felt if a game was considered goo or great on a 16-bit system, then it's still good or great on a 32/64-bit system, improvements or not. Platformers are a genre where more powerful systems don't mean better game play than an inferior system can deliver, just better graphics. Graphics don't make a game great. That's coming from an artist who really loves graphics and especially seeing modern indie games raising the graphical bar on vintage systems. 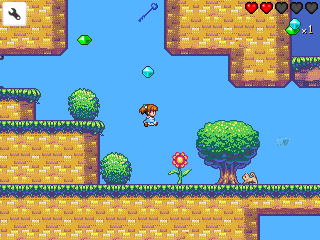 Actually, with Alice's M.R., I've seen 8-bit platformers with, IMHO, prettier graphics. But it's supposed to look old-school. Edited by Gunstar, Sun May 24, 2015 10:40 AM. I'm perfectly happy that I got this game for what it cost. I think it gets funnier and funnier. Hope you change your mind about it. If I had make the game difficult to play on the first level, people would have say "this game is too difficult", and now I'm getting "this game is too easy"
It's hard to balance this by level design. Some people are struggling to pass Level 5 for example, so I can't believe how they could pass the last levels.. I wanted a game who is accessible to everyone, even casual player, and then it gets more and more challenging, especially on world 2 and 3. It just take some times to get there. Now, there is no way this game could have run on an 8bits platform, it use 256 colors, and lots of different tiles graphics, you should look again at real 8bits games. Edited by Orion_, Sun May 24, 2015 12:41 PM. I'm not sure if this entire reply is directed solely at me, but I did state it's getting more difficult, I'm just not impressed at how it's getting more difficult so far. And as to not being able to do quite similar graphics on an 8-bit because you are using 256 color mode seems to me to be and empty claim simply because I have seen no where near 256 colors on screen (so far), and I have seen MUCH more color Atari 8-bit games that used display list interrupts to get far more colors on-screen from the 256 color palette. Crown Land on the Atari 8-bit seems much more colorful to me. Though you are right, in that I haven't played any recent 8-bit indie games, like Crown Land, in more than a year, so maybe Alice is using more on-screen colors but they are just bland or something...again, so far, no final judgments here, I'm only like what? 20% into the game? All that being said, once again, I'm NOT complaining about how many colors it has or that it's 8 or 16-bit looking, I knew that going in, you are selling it as a classic style platformer, and I assume that includes the simpler graphics. My only real complaint, so far, is actual game-play, and I admit I'm only a few levels in. Edited by Gunstar, Sun May 24, 2015 1:57 PM. Thanks for the side-by-side, and yes, Alice is a bit better graphically, mainly due to higher resolution, and if there are more colors on-screen they are subdued (shading and such that CL lacks) because Crownland looks almost as colorful and it's 8-bit and it uses a standard 4 color mode and sprites and DLI's and achieves quite a colorful game that compares well, IMHO . Alice would look very good using Similar graphics to CL on an 8-bit level. Really, your side by side, IMHO, proves my point to an extent. Sure Alice has better sound, better res, and better frame rate and definately more colors (though crownland is close, I think like 20-24fps). Some things are just naturally better on better hardware without even trying. But graphically CL looks to be only a small drop, mainly because Alice is meant to be 16-bitish. My original point was that great graphics don't make a great platformer, great game play does, and so far, over all, I like Crown Land better. I don't dislike Alice, just hoping there is more than what I have seen in game play so far. Maybe it's the empty backgrounds in Alice...but if I am to look closely and try and count colors on-screen I Alice, do you think I'd come close to 256? Definitely 16-bit SNES quality though, for sure, and that's what you were going for, right? Please don't misunderstand why I am debating this, it's not because I think you have to use 256 colors or even close just because you can, I'm pointing it out because you said it couldn't be done because it is uses a 256 color mode on the Jag (and presumably DC and PC too, I haven't seen them yet). I think you could pull off Alice, with hardly any noticeable drop in on screen colors if you did it on ST or Amiga with 16 or 32 on screen colors and a few tricks (like A8 DLI's), and easily on the Genesis with it's 64 on screen colors. Such a long discussion about an area of the game that I'm not complaining about...how about we discuss your decision to have so few character opponents or other interactions. You did mention wanting it to appeal to a large audience and the casual gamer, but a difficulty setting that is higher and adds in more "stuff" is an option too. Edited by Gunstar, Sun May 24, 2015 7:26 PM. I think this game is excellent. It's a different game, why does it have to be similar to other games? The graphics are excellent, and the playability is just fine for me. I don't think all games should have the same playability and difficulty... I think it's just right. I don't suppose... there's any chance in hell this will end up being reprinted on carts??? maybe this will happen, maybe it wont, who knows !!! Well, I don't know who Who is, but if Who knows, he should tell us! When this gets reprinted on cart, who gets the money? You know, I just want to quote myself for awesomeness here. Yesterday, early-afternoon. 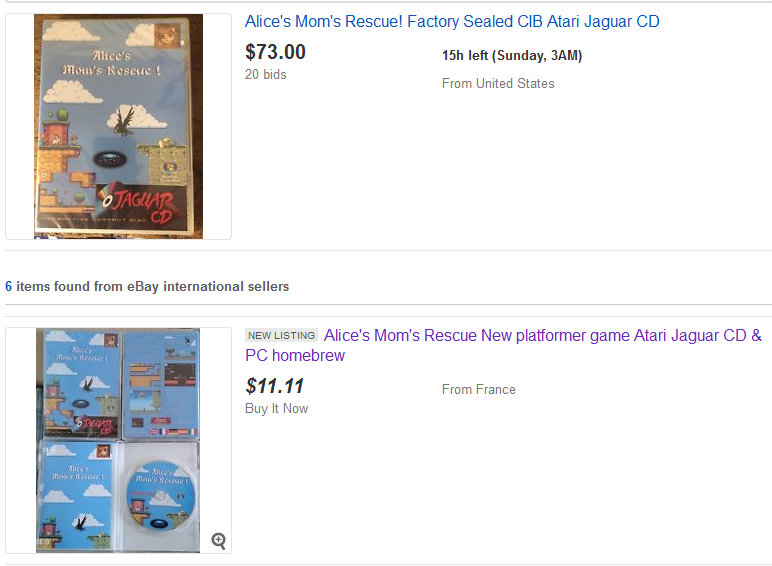 I made a comment about how it would be awesome if Alice's Mom's Rescue was released on cartridge. I had no previous knowledge of any such endeavor. Not an hour or so later, and it gets announced that Alice's Mom's Rescue is released on cart. I don't suppose... there's any chance in hell that Robinson's Requiem, Hexen, Heretic, Doom 2, or Rebooteroids gets offered on carts??? And quoting yourself is the greatest thing a Friday night! For a limited time "Alice's Mom's Rescue" is available cheaply as part of an Indie Gala Bundle (well, the PC version is ). sometimes I don't understand, maybe I should add "sealed !" in the title ? A lot of people in the US will not buy from dirty forners. Awesome, they all state "SEALED" now = ) .. I better buy what I want before they disappear! Yes, original Jaguar games "New In Box" is much more seldom out there than an year ago, most are opened "Complete In Box". And people tend to buy NIB/sealed for higher prices. Edited by Atlantis, Sat Feb 20, 2016 9:40 AM. Yep just bought one also, Thanks Orion. Oooh! Gonna grab this! Looks great! Alright... don't hate me. I'm selling my SPARE copy of Alice's Mom's Rescue on Cartridge. I'm moving to San Antonio and looking to buy a new house, and I'm selling stuff I don't absolutely need. I still have my normal copy, and I also have it on CD as well... so I'm just selling my spare copy. It's brand new in the box, never played. All the original stuff is included. One of my favorite games on the system. And before everyone hates me... I've stopped buying 2 copies of every game. The last three or four games I've bought, I've only bought singles. There is 2 last copy of the game available on ebay !